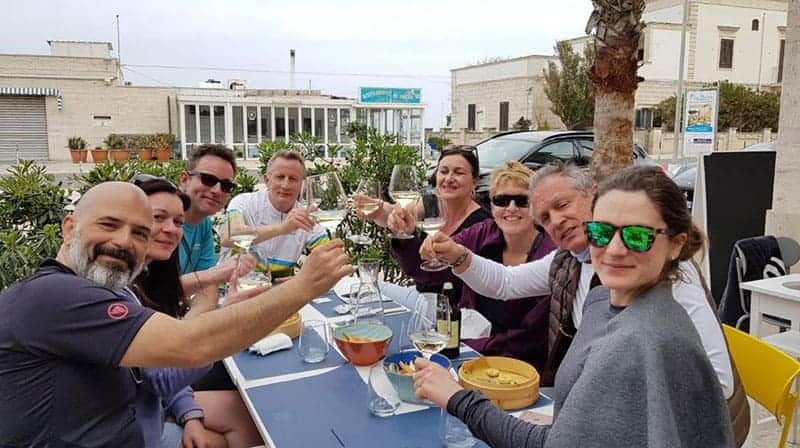 Meon Marketing Manager Ed Texier gets a unique taste of Southern Italy courtesy of activity experts Headwater Holidays and Exodus adventure travel. 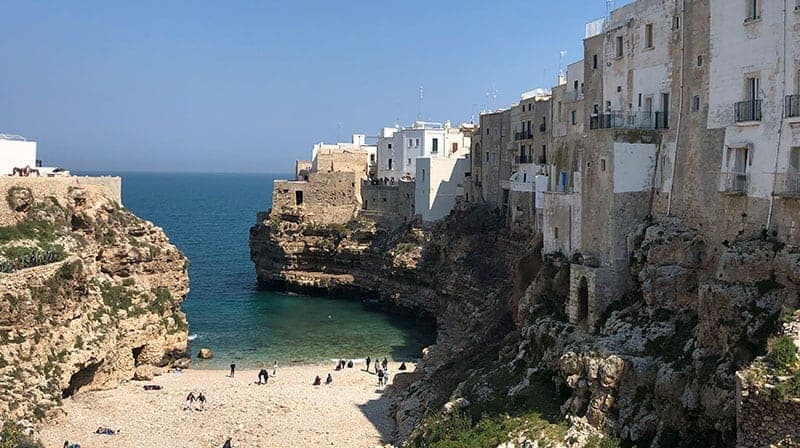 Puglia or Apulia – a relatively undiscovered piece of Italian paradise nestled within the ‘heal of Italy’. Rumoured to offer some of the finest artisan cuisine, beautifully preserved ancient cities surrounded by rolling countryside containing 50-60 million olive trees, vineyards and anything that would flourish in a region boasting up to 350 days of sunshine. Puglia is serviced through two main hubs, Bari and Brindisi by British Airways, Ryanair and easyJet. A mere 2.5 hours flying from Gatwick brought us to Bari where we were met by our tour guide Domenico ‘Mimmo’ Angelillo. 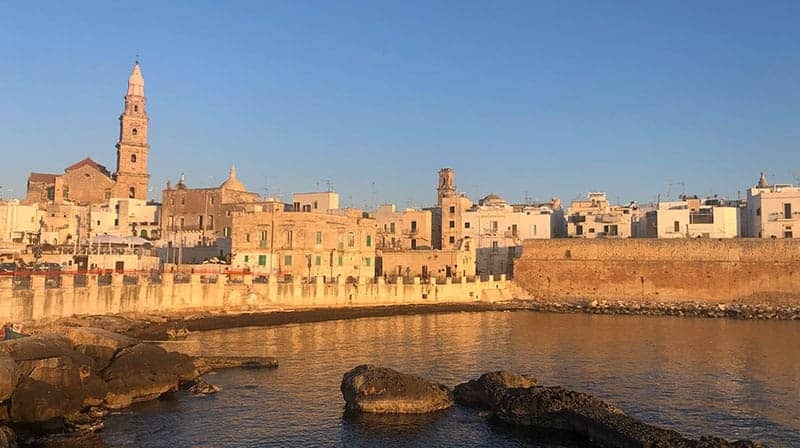 Our first night was spent in the coastal town of Monopoli featuring a Baroque Cathedral containing an archaeological museum with sculptures and ancient tombs. 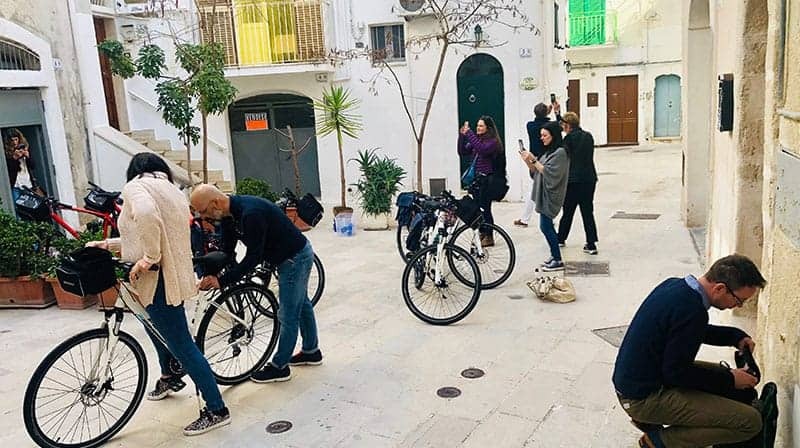 A swift check-in procedure at hotel Albergo Diffuso was followed by our bike fitting facilitated by the very able Puglia Cycle Tours team. Equipment is of a high standard with a mixture of Specialized Hybrids and e-bikes from Atala. Dinner was at the centrally located Komera, a highly recommended contemporary restaurant specialising in seafood. 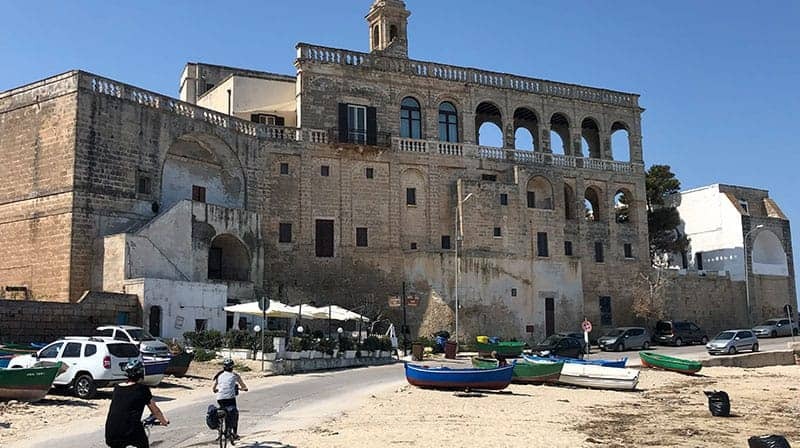 Day 2 and we were off on our bikes in a northerly direction along the Adriatic coast using our self-guiding GPS app and stopping at Polignano a Mare for a taste of the famous homemade “gelato” cream tasting and a delightful lunch at Locanda dell’Abbazia in the hamlet of San Vito, featuring the spectacular Abbey of San Vito. 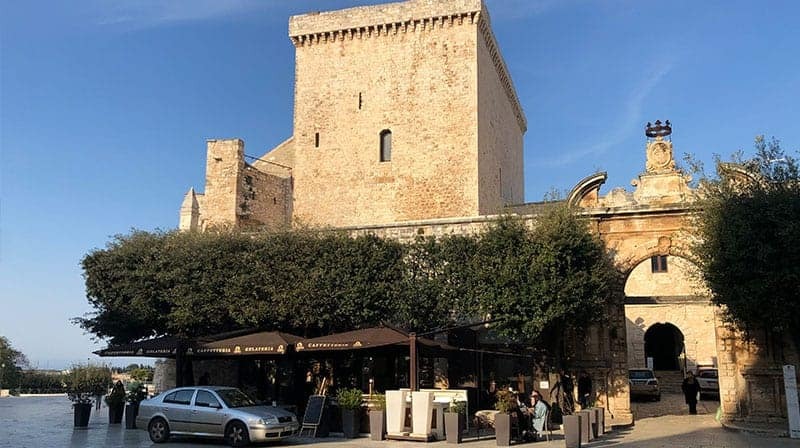 Fully refueled with seafood pasta and local white wine, we made our way inland through gently rolling countryside covered in a patchwork of almond orchard, olive groves and vineyards to the ancient town of Conversano featuring a 6th century medieval castle and 11th century Romanesque cathedral. We checked into the cozy, chic Corte Altavilla Hotel, centrally located to all main attractions and set in an 11th entry stone-built complex. Our bags were already delivered to our rooms, this forms part of the tour service. The narrow-cobbled streets are worth exploring and helped build a nice appetite for dinner at Vita Pugliese, another highly recommended restaurant offering local produce and at a fair price. 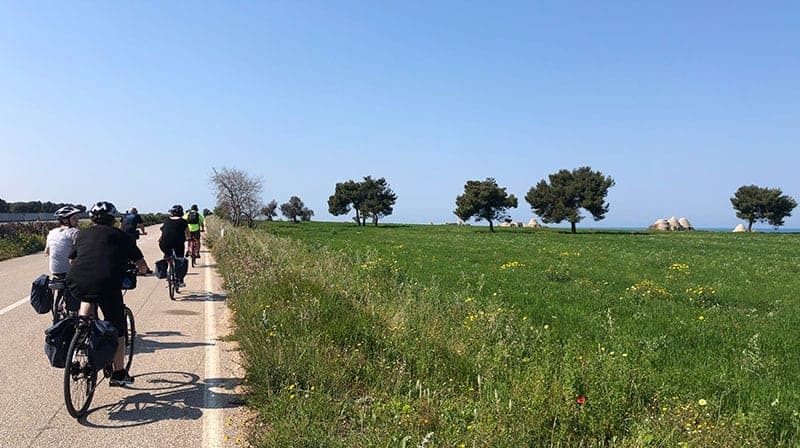 Day 3 delivered the third longest itinerary, approximately 45k in sunny 18c spring conditions, perfect for another ride through beautifully scenic country lanes lined with weathered stone walls to the 18th century picturesque town of Alberobello. 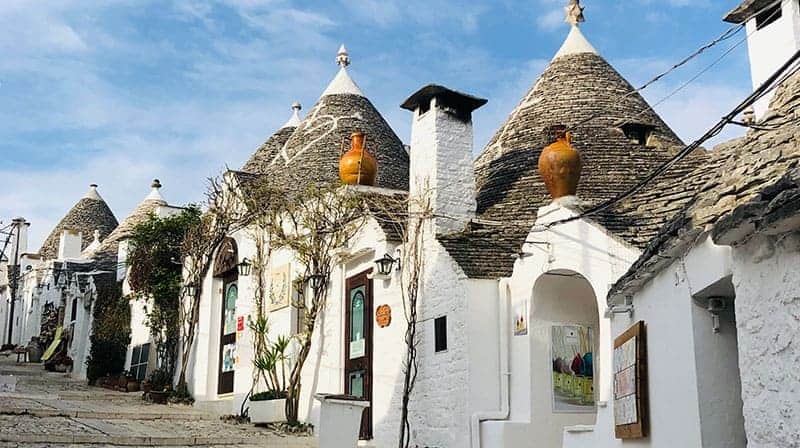 This unusual destination has been made a UNESCO World Heritage site for its unusual districts of Trulli, the characteristic white-washed conical-roofed houses which can be found dotted all over nearby countryside. It’s within these Trulli that we stayed at the charismatic Trullidea hotel, offering guests a ‘truly’ authentic experience like no other. It’s worth mentioning that due to the UNESCO status, you will find a lot more tourists here than anywhere else on the tour itinerary. 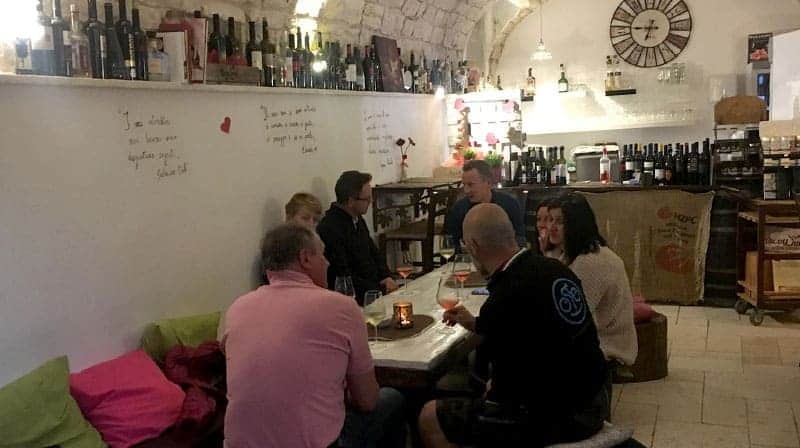 A swift tour around town was followed by wine tasting at Paco Wines and dinner at Terra Madre – THE place to go if you’re into vegan and vegetarian cuisine. The Terra Madre team pride themselves on producing artisan, organic produce using compost made from their own biodegradable products. You also will find rabbit and veal on the menu although this wouldn’t be the place to go if you’re a die-hard meat eater. Day 4 was our final, longest day in the saddle to Pezze di Greco but also the most pleasant with most of this sector being downhill with spectacular panoramic views across the Adriatic coastline and as far as Albania. We visited the small coastal fishing port of Savelletri where we lunched before our final leg to Masseria Salamina, a stunning aristocratic 17th century farm house set within a sprawling estate containing vineyards and olive groves, which the Masseria uses to develop their own range of organic olive oils and cosmetic products. All 20 rooms are sympathetically decorated in keeping with the rich history of the Masseria and are available in various configurations. 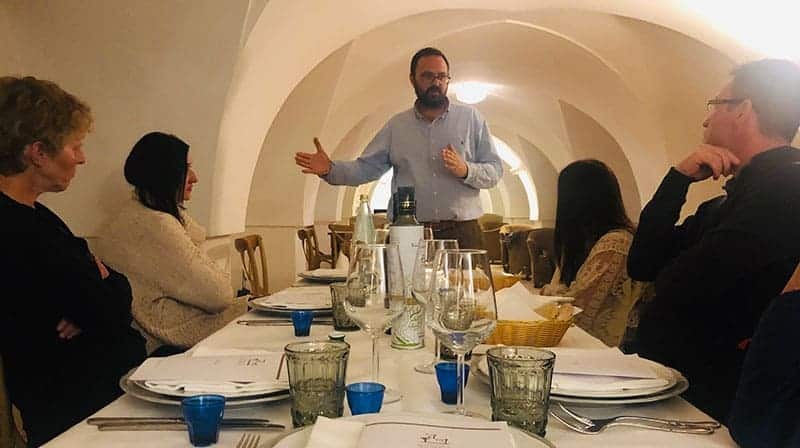 A quick shower and it was time for a guided and professional olive oil tasting session, hosted by owner Filippo de Miccolis Angelini. A recommended, yet optional experience includes a thorough explanation of the olive growth process as well as a history lesson of the property. 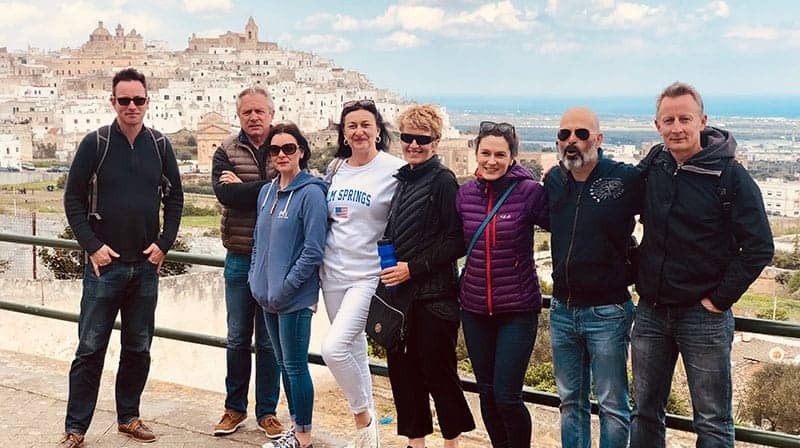 Our final tour day included a trip to nearby Ostuni, one of Puglia’s most beautiful towns strategically located atop a hill offering impressive views of olive groves and the glimmering Adriatic Sea, only 8km away. Our tour guide Mimmo had mentioned he had a surprise and before we knew it, we were whisked away in a couple of Piaggo Ape convertibles like a scene out of the Italian Job! 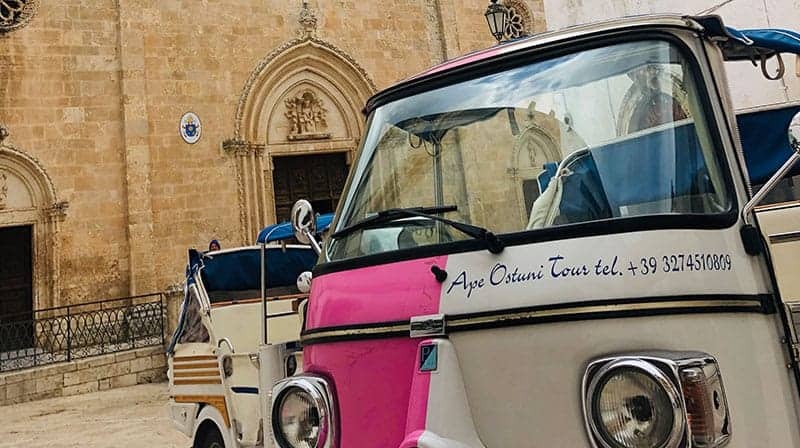 Good thing they were electric which allowed us to enter the historic town featuring a 15th century Cathedral at Ostuni’s highest point. 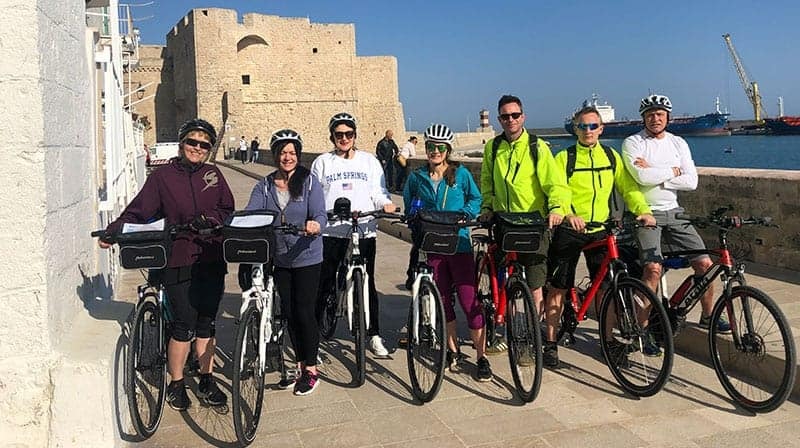 This really was a superb way to travel around, and again something I can highly recommend as a novel addition to your itinerary – thank you Mimmo for sorting! 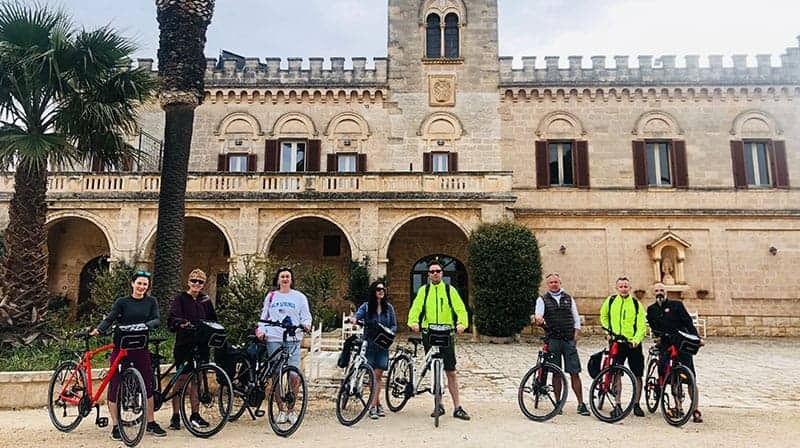 Is cycling the best way to experience Puglia? Without a shadow of a doubt. 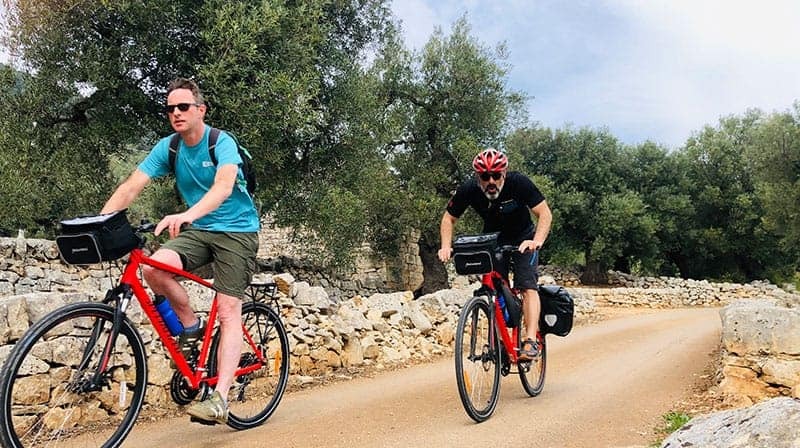 This may seem biased coming from a keen cyclist but with an impressive array of hardware, courtesy of Puglia Cycle Tours, you can select standard bikes, e-bikes and even tandems, there’s something for everyone. 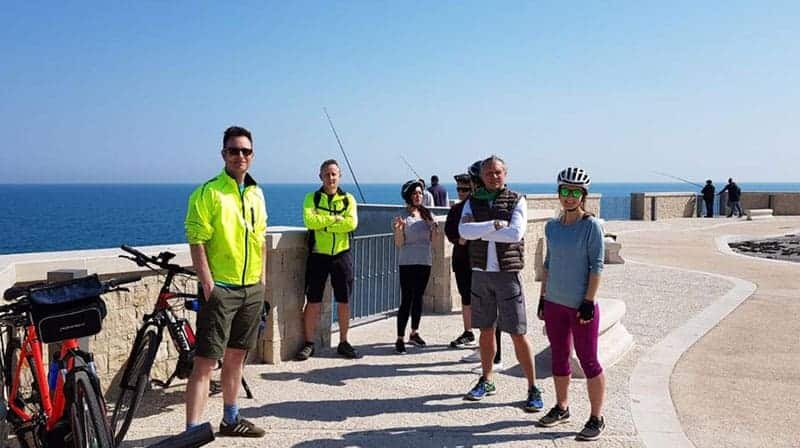 A massive thank you to cycling and walking holiday specialists Headwater and Exodus for facilitating an unforgettable adventure. The tour was superbly organised from start to finish with exceptional attention to detail.